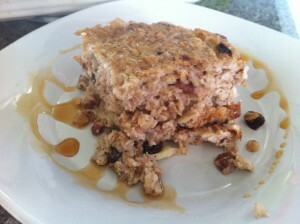 Baked soaked oatmeal is delicious and really nutritious. Design your own using different dried or fresh chopped fruits, nuts, and toppings. Oats contain phytic acid that inhibits your absorption of minerals. Soaking in a combination of whey and buckwheat flour will help neutralize much of this. I recently started adding the buckwheat flour for phytase, oats are low in this enzyme critical to breaking down the phytates. The acid medium (whey, kefir, lemon juice) is the catalyst but it still needs the phytase to work. Soaking this way ensures you get more of the benefits of slow buring carbohydrates, fiber, thiamin, folate, phosphorus, manganese and magnesium . Also since it’s made with six pastured eggs it’s also loaded with omega 3’s, vitamin A, vitamin B, and beta carotene. Add optional extras! Top with fresh whipped cream, syrup or yogurt. Put the oats and nuts into a glass mixing bowl. Add enough drinking water to completely submerge your oats and nuts. Add a teaspoon of salt and four tablespoons of fresh kefir, whey, yogurt, or buttermilk. Add 4 tablespoons of buckwheat flour. Allow the oats and nuts to soak, covered, overnight at room temp – about 12 hours. After the mixture of oats and nuts has soaked, dump them into a colander to drain, lightly rinse and place the mixture back into the mixing bowl. Grease a glass or stoneware 13 x 9-inch rectangular or a square 9×9 inch baking pan with butter or coconut oil. The 9×9 will nice and thick, I think I prefer this size. Meanwhile beat together eggs, cinnamon, maple syrup, and milk. Mix in melted butter or coconut oil. Pour that mixture into the soaked oats mixture and stir until combined. Add the apples, or other fruits last and mix. Pour into a greased baking pan evenly. Bake in an oven preheated to 375 degrees for 45-55 minutes or until the oatmeal has golden-brown color on top and is firm to touch. Serve with a bit of maple syrup or fresh real whipped cream. Or both!